We therefore expect this decrease in the mobility to be proportional to T-3/2. The effect of ionized impurity scattering, however, decreases with increasing temperature due to the average thermal speeds of the carriers being higher. The carriers spend less time near an ionized impurity as they pass and the scattering effect is thus reduced. This is modelled by assuming that no scattering will occur unless the electron is close enough to the ion for the electrostatic energy to be comparable with the thermal energy. Therefore we can expect the mobility due to ionized impurity scattering to increase as temperature rises according to T+3/2. In general, ionized impurity scattering dominates at low temperatures, whilst at higher temperatures, phonon scattering dominates. Experimental values of the temperature dependence of the mobility in Si, Ge and GaAs are listed in table below . Note that both the carrier concentrations (Ne and Nh) and the mobilities depend on temperature, though with different functional forms. In the extrinsic temperature range, where T is only large enough to ionise any donors within the semiconductor, the carrier concentrations remain constant and the only change in sigma with temperature results from the change in the mobilities. Assuming phonon scattering dominates, we know μ varies as T-3/2. Thus we know σ~T-3/2, and given that σ=1/ρ and ρ∝R we can determine that R~T3/2. which implies that I, and thus VH vary according to T3/2. In reality, these fluctuations with temperature are quite small and VH may in practice be considered constant in the extrinsic regime. 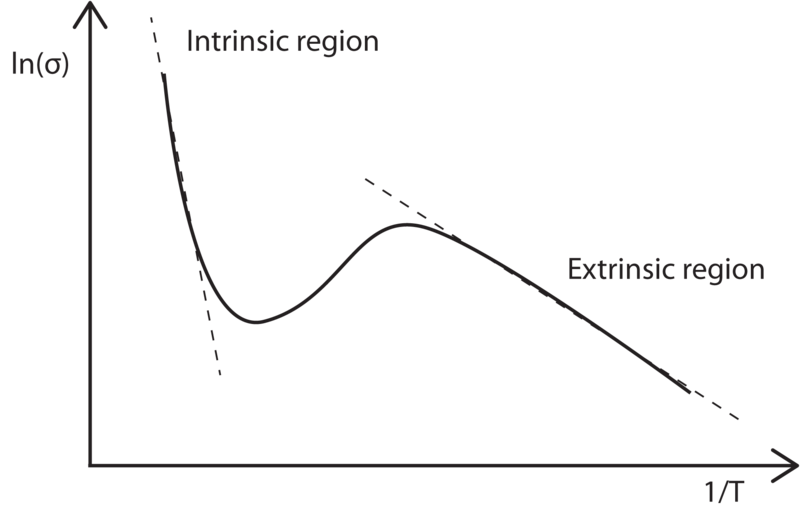 In the intrinsic region in which the temperature is high enough to excite charge carriers up from the valence band into the conduction band, the carrier concentrations (Ne and Nh) increase exponentially with T. This dominates any mobility affects on the electrical conductance and results in a rapid decrease in the resistivity of the semiconductor with increasing temperature. Thus the Hall voltage falls as T increases. We can once again ignore the T3/2 variation, which will be mostly negligible compared with the exponential temperature variation. Thus a plot of ln(σ) vs 1/T will have a slope of –Eg/2k, which yields a value for Eg. In the case of doped semiconductors, we note that at high temperatures they are intrinsic in behaviour and become pseudo-intrinsic at low temperature, with and energy gap equal to the gap between the impurity level and the band edge. Therefore on a plot similar to the one mentioned above we would expect two straight-line regions with different slopes. In the region between these slopes the temperature is high enough to ionize the donors fully but not high enough to ionize an appreciable number of electrons from the lattice. Hence, in this temperature rage the carrier density will not be greatly influenced by temperature and the in mobility that were previously neglected will determined the shape of the curve.